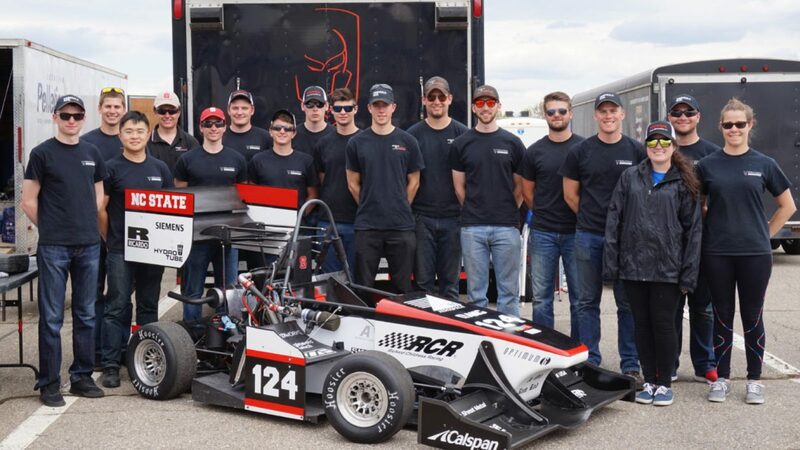 The MAE Formula SAE Team won first place at the 2018 SAE Carolina Collegiate Student Night last Thursday, February 1st. The event, held at the Center for Manufacturing Innovation in Greenville, S.C., hosted eight universities with SAE Collegiate Design Series (CDS) teams. Other than NC State, schools included: UNC-Charlotte, University of South Carolina, Georgia Southern, UNC-Asheville, NC A&T, Duke, and the host school, Clemson. Teams were judged on their 2017/2018 CDS projects and presentations. SAE International’s Collegiate Design Series takes learning beyond textbook theory to designing, building and testing the performance of a real vehicle. CDS provides world-class, hands-on learning experiences for undergraduate and graduate students, developing and training the next generation of mobility engineers. The diverse menu of competitions includes Aero Design, Clean Snowmobile Challenge, Formula SAE, Formula Electric, Baja SAE, and Supermileage.